All's fair in carrots and war! Find the Magic Carrot and claim ultimate glory over your opponents in the all-new Killer Bunnies and the Conquest of the Magic Carrot, the fun and crazy follow-up to the popular Killer Bunnies Quest card game. You'll be surprised by an entirely new array of wacky weapons, risky P-cards, and wince-worthy Terrible Misfortunes in the Killer Bunnies Conquest Blue Starter Deck, which can be played on its own, and is completely compatible with the Killer Bunnies Quest Blue Starter (and boosters). Some people may dislike “luck” based games and this game is definitely not for them. The mechanic used to win the game is having the right card at the end of the game, the problem is you don’t know what that card is until the end. You can only increase the odds that you have the right card by gaining as much cards as possible. This version of Killer bunnies is a follow up to the Killer Bunnies and the Quest for the Magic Carrot. Follow up is not quite the right term, it’s more of a reload / remodel of the the game. Very little is different except the jokes on the cards. There are some small changes, but if you played Quest, you know how to play Conquest. Killer bunnies is a card drawing game where you take on the role of bunnies trying to find the magic carrot. The game is simple to learn in one or two play throughs and the instructions are very easy to understand. I especially like instructions that teach you as you play as these do. There are some definite holes in some the rules that are not explained right away and may require house ruling if no FAQ can be found. Also there are so many different mechanics in the game, some of them may never be used in an entire game if the right cards don’t show up. This can be frustrating to some players as they may be set up to defend against a certain style of play and it never happens because there opponent didn’t get the cards in the first place. Killer Bunnies is at its core a fun, sometimes quick, filler game. There is no real stress in the game as luck plays such a major role in the end. This can be frustrating to new players as they may be used to heavy strategy, but once you accept the fact no amount of strategy will guarantee a win, the game will become more fun. I highly recommend this game for casual, social, and some avid player due to the quick easy play style, and the different fun situations one can get in. I don’t recommend this for the Power, or Strategy gamer as the game doesn’t reward great planning. Who knew you could make a game out of an unending list of bizarre and ridiculous ways to kill off bunnies? But here it is. The object (simplified): collect bunnies, and keep them alive against the myriad cards your opponents will play against you to kill them off (things as unusual as feral meatballs and meteor showers), because you must have at least one to win. At the same time, collect carrots and try to amass as many as possible because in the end, only one is the winning carrot. It’s completely chance that determines which one, but the more you have, the better your chances. My kids took to this game and for some reason they keep going back to it, even though it sometimes causes tears and arguments. I think the biggest appeal is the slap-stick gruesomeness of the various bunny deaths. It’s a crazy kind of humor, which takes a certain taste to appreciate. There are so many cards (and expansion packs to make it even more so) that the game doesn’t get boring too quickly. My kids are always finding cards they hadn’t seen before that throw new twists into the game play. My issue with it is the feeling that no matter what happens, the winner is pretty random. But this game seems to be more about the journey than the destination. This is not my favorite of the recent games that I have played. It was difficult to grasp at first with a lot of different types of cards. During play time once we got the rules figured out, I got a bit bored and occasionally frustrated. The concept seemed cute and the bunnies were amusing and creative, but that was not enough for me to find the game terribly enjoyable. In Killer Bunnies, your goal is to get as many carrots as possible, because at the end of the game, a random carrot card is drawn and that determines who the winner is. It doesn’t matter how much of any other resources or how many bunnies you have in play, it comes down to that random card. Basically, this is a card game in which you have bunnies in play collecting resource cards (water, lettuce, and carrots). Your goal is to get as many carrots as possible. The other resources and your bunnies in play certainly help you have more opportunities to get carrots. So there’s that. In the end, our gaming group wasn’t super impressed! 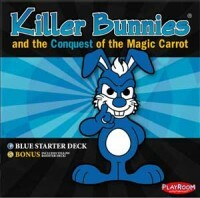 Add a Review for "Killer Bunnies: Conquest – Blue Starter Deck"